['Coke of Norfolk': Thomas William Coke, 1st Earl of Leicester, politician and agricultural reformer.] Autograph Signature ('T W Coke') as frank on letter to William Barth of Yarmouth. 'Holkham. Aug. Twenty Third | 1830 -'. On 14 x 12 cm section cut from front panel of envelope. In fair condition, lightly aged. Cropped postmark at head. Laid out in the customary fashioni, and reading: 'Holkham. Augt. Twenty Third | 1830 - | Willm. Barth Esq | Yarmouth | Norfolk | T W Coke'. Manuscript note at foot in another nineteenth-century hand: 'Mr. Coke, M.P. of Holkham Norfolk - afterwards 1st. Earl of Leicester'. [Pakistan, Palestine and Israel.] Duplicated document, issued by the British Philatelic Association, on 'Export & Import Control', and including sections on 'Palestine' and 'Imports from the United Kingdom into Pakistan'. 'B. P. A. [British Philatelic Association] | 3, Berners Street, | [London] W.1. | 4/3/48 [i.e. 4 March 1948]. 2pp., foolscap 8vo. Typed and duplicated on one leaf. In good condition, on lightly-aged paper, with fold lines. The Pakistan had been established on 14 August 1947, and Israel would be established from part of the British Mandate of Palestine on 14 May 1948. The present document is an interesting artefact of the changes in postal arrangements regarding these two regions at the time. The top half of the first page is headed 'Palestine', and the lower half 'Imports from the United Kingdom into Pakistan'. The reverse carries sections on 'Exports' and 'Imports'. 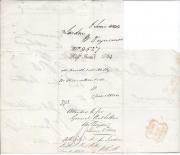 Autograph Note in the third person, with signature ('Wrothsley') on frank. 12mo, 1 p. Bifolium. Good, on lightly-aged paper, with thin strip of stub adhering to the reverse of the second leaf. Reads 'Sir John Wrothsley requests Mr. Ridgway will direct his Newspapers [corrected from 'Letters'] Post Office Scarborough. The frank reads 'Doncaster September ten 1835 | Mr. Ridgway | Piccadilly | London | [signed] Wrothsley'. Divided circular Doncaster postmark in black, and frank ('FREE | 11SEP11| 1835') in red. 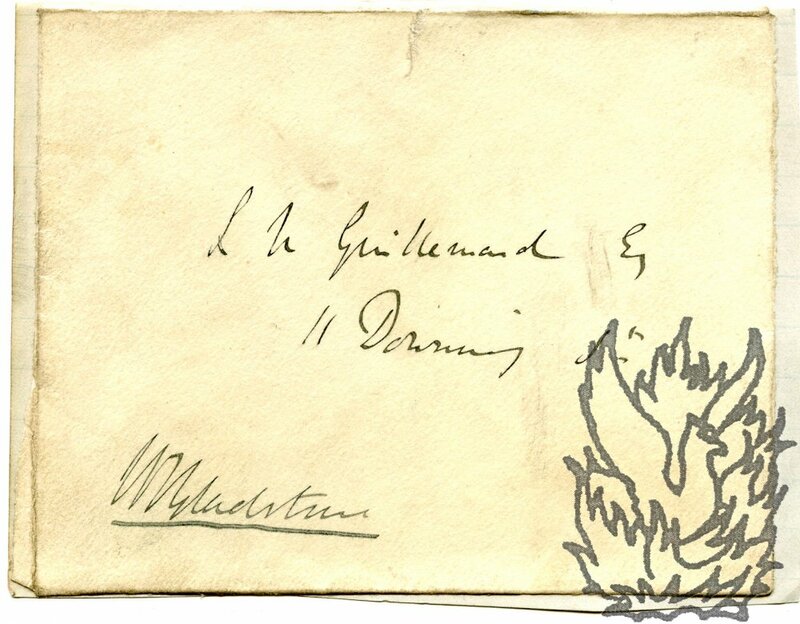 Autograph Signature ('W E Gladstone') on frank, addressed to Guillemard at 11 Downing Street. The front cover of the envelope, 9.5 x 12 cm, cut away and laid down on a ruled piece of paper cut from an autograph album. A little grubby, but good. 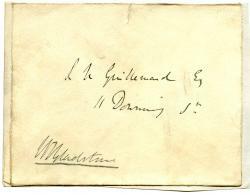 Reads 'L N Guillemard Esq | 11 Downing St. | [signed] W E Gladstone'. Signature approximately 4.5 cm long, and underlined. 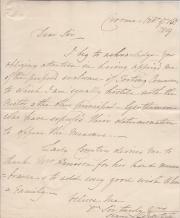 Archive of thirty-four Autograph Letters Signed and fifty-two Typed Letters Signed, to Baker, with two Autograph Letters Signed from Campion's wife, and drafts of three of Baker letters (two autograph and one typed), exhibition catalogue, etc. 1953 to 1978. 22 Erridge Road, Merton Park, Wimbledon (until 1971); 13 Argyle Court, Argyle Road, Southport (from 1972). The archive is in very good condition, with very slight creasing and aging, and with all items entirely legible. Most items quarto, and most of two pages or more (one running to seven pages). One letter has the head and first paragraph cut away. All but the first two items, which date from 1953 and are signed 'Sidney R Campion', are signed 'Sidney'. The bulk of the correspondence dates from the 1970s. An important archive consisting almost exclusively of long, interesting and discursive letters addressed to a close and trusted friend. Signed postal frank, addressed to his wife, with post mark and short autograph note. On one side of a piece of watermarked laid paper, 22.5 x 29 cm, folded to make an envelope, 9 x 21 cm. A thin strip of paper (not affecting text) has been torn away in the breaking open of the wafer, under which it still adheres. On aged, grubby paper, with a couple of pin holes and a few closed tears to extremities. Address reads 'London, May thirty first 1822. | Mrs: Manning, | West Cliff. | Brighton.' Signature, in bottom left-hand corner: 'Wm Manning.' 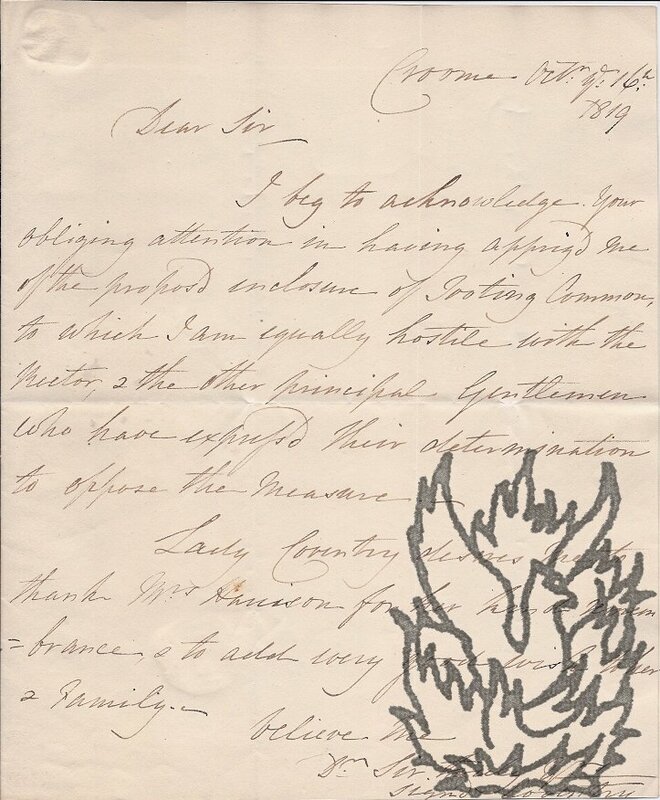 Autograph note to one flap: 'I will take Measures about Mr: Mundy immediately | W: M/'.